“By 1927, according to Homer B. Vanderblue, most of the elaborate real-estate offices on Flagler Street in Miami were either closed or practically empty; the Davis Islands project, "bankrupt and unfinished," had been taken over by a syndicate organized by Stone & Webster; and many Florida cities, including Miami, were having difficulty collecting their taxes. By 1928 Henry S. Villard, writing in The Nation, thus described the approach to Miami by road: "Dead subdivisions line the highway, their pompous names half-obliterated on crumbling stucco gates. Lonely white-way lights stand guard over miles of cement side- walks, where grass and palmetto take the place of homes that were to be.... Whole sections of outlying subdivisions are composed of unoccupied houses, past which one speeds on broad thoroughfares as if traversing a city in the grip of death." In 1928 there were thirty-one bank failures in Florida; in 1929 there were fifty-seven; in both of these years the liabilities of the failed banks reached greater totals than were recorded for any other state in the Union. The history of the Florida bust suggests the current real estate bubble will eventually end in bank failures. It warns against being a depositor at an institution based on mortgages. Instead we prefer holding interest-bearing cash at conservative brokerages with a history of low customer legal disputes. The recent selling in municipal bond funds should also come as no surprise, as property tax revenues will fall with property values. In our current environment, investors would be wise to examine risk with the same zeal as they did returns in the bull market. The only difference between financial institution illiquidity and insolvency is hope. Former Goldman Sachs investment banker and author John Talbott explains: "Everybody is hiding and not disclosing losses," he says. "They're all winking and nodding at each other because they've all got this stuff on their books." Eventually something will force the issue. We don’t know if it will be regulatory bodies, bank runs, or a self-confession (highly unlikely). What is a financial institution to do? Call in loans? This will create forced selling, more fear, and more demands for its cash. Talbott continues: "Giving a bank more cash doesn't solve the problem. What they're sitting on is huge losses and they can't recognize those losses without endangering their entire book equity and threatening bankruptcy and threatening a run on the banks." The Bank of England was established in 1694. There have been quite a few financial panics and bank failures since that time. Similarly, the Federal Reserve was created in 1913 and oversaw roughly 9,000 bank failures during the 1930’s. History warns that central bank planners will not succeed against market forces. And as the investment banks are doing now in 2007: “First Boston waited for a market rebound that never happened.” The conclusion? According to Fortune, “First Boston was stuck with its loan, developed its own financial woes, and ultimately was subsumed by Credit Suisse.” As we continually remind investors, “Golden Eras”, “Era’s of Good Feeling”, “Gilded Ages” or “Roaring” periods are followed by economic and speculative downturns. 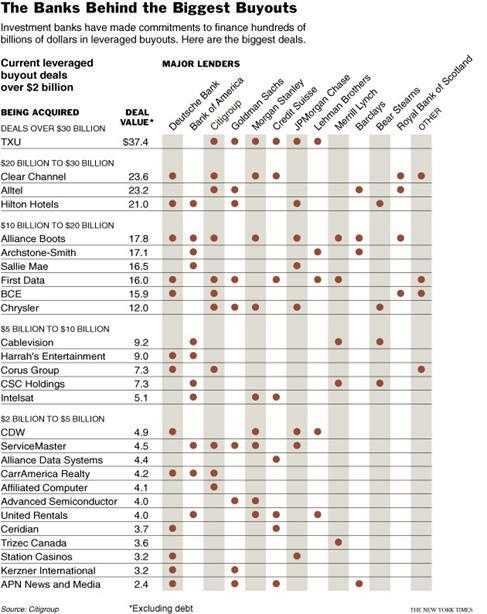 Who survived the leverage buyout mania of the late 1980’s unscathed? Goldman Sachs. According to Businessweek: “In the 1980s, it shunned big risks…Goldman’s refusal to make bridge loans undoubtedly cost it business, too. But now the company looks smart.” They “don’t have to worry about big losses from the debacle in junk bonds and bridge loans.” Why didn’t they chase the craze? Because they were private, the bankers owned the firm: “Goldman’s 128 general partners are the firm’s shareholders.” But times change and Goldman went public in 1999. With no ownership, investment bankers have made their fees and jumped ship. As you can see above, Goldman Sachs (along with other public investment firms) are now stuck holding bridge loans that threaten their institution’s financial strength. If a bank is in trouble, what is a quick way to get cash? Perhaps raise fees. Notice these higher fees apply to non-customers. The same psychology is raising the rate that banks use to borrow cash from each other. The lack of cheap cash in the money markets was the reason given for the troubles at Northern Rock. In this environment, one of the most overvalued investments is the Certificate of Deposit offered by mortgage lenders and banks. Yields should be much higher to compensate investors for taking the risk that the bank might not be around to pay the depositor back. 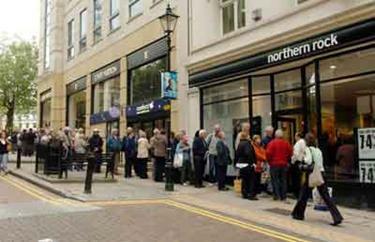 For instance, Northern Rock is now offering 7% on their deposit accounts. In this environment, the return of capital is most important, not the return on capital. We have been hesitant at making the comparison until more evidence was widely circulated in the mainstream media. But at Enron, complex transactions (some fraudulent and inflated in value) were pushed off the balance sheet to hide losses from investors. As these deals lost value and scams were revealed, investors lost confidence, forcing Enron into bankruptcy. During the credit mania, Wall Street firms created structured investment vehicles (some “only leveraged 14.24 times”) that are off the bank’s balance sheet. Their losses are now mounting. Barclays has already had to pay $1 Billion to keep an SIV afloat. More problems will surely follow. So what was their reasoning for keeping these transactions hidden? “Banks wanted to avoid consolidating these vehicles because doing so would balloon their balance sheets and force them to restrain lending.” It was a way to perpetuate the mania in credit. We expect the hidden losses to mount, continuing troubles in the commercial paper market which will force more job losses. If one particular institution reveals large losses, an Enron-style ‘loss of investor confidence’ event would occur. The jobs situation proves that we aren't going into an inflationary period. With folks and financial institutions leveraged to the gills with debt, job losses ensure bankruptcy, default, and foreclosure. These will be massive deflationary forces on traditional assets. Protectionism, environmental regulation, less migrant workers, energy costs, weather, Chinese growth, we don’t know what ‘reason’ will be attributed to agricultural price increases. But we expect food prices (and cotton!) to dramatically rise in 2008. As Murray Rothbard described in our May article describing the Panic of 1837: “By the fall of 1837, one third of the work force was jobless, and those still fortunate to have jobs saw their wages fall 30-50% within 2 years. At the same time, prices for food and clothing soared.” As Marc Faber recently said “portfolio managers would do well to learn how to drive a tractor.” Of course this will further squeeze the homeowner trying to make a payment on an adjustable rate mortgage. We will be covering this in future reports as the rising trend becomes crystallized.